We drew a lot of different representatives of different professions and different sports. 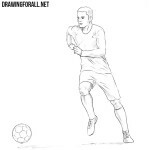 We have already shown how to draw a football player, basketball player and a wrestler, and today the team of drawingforall.net created a tutorial about how to draw a gymnast. 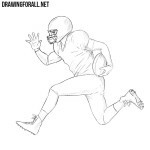 In order for the drawing to be even and proportional, first of all we need to outline the skeleton of our character. Outline the head and line of the spine on which we place the chest and pelvis. We finish the drawing of the skeleton by sketching the arms and legs. 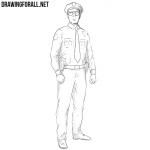 In order not to be mistaken in proportions, visit the lesson on how to draw a man. Now we need to make our gymnast more voluminous. First, we outline the neck and the outlines of the torso, which should be narrowed at the waist. After that, with the help of very simple geometric figures, we outline arms and legs. This step, like the previous and the next, should be done using very light lines. Now we will turn the usual dummy into a gymnast. For this we sketch out the outlines of the main details. Let’s start with the head, sketching the outlines of hair and details of the face. Next, go to the torso, sketching the outlines of clothing and signs on the back of the gymnast. 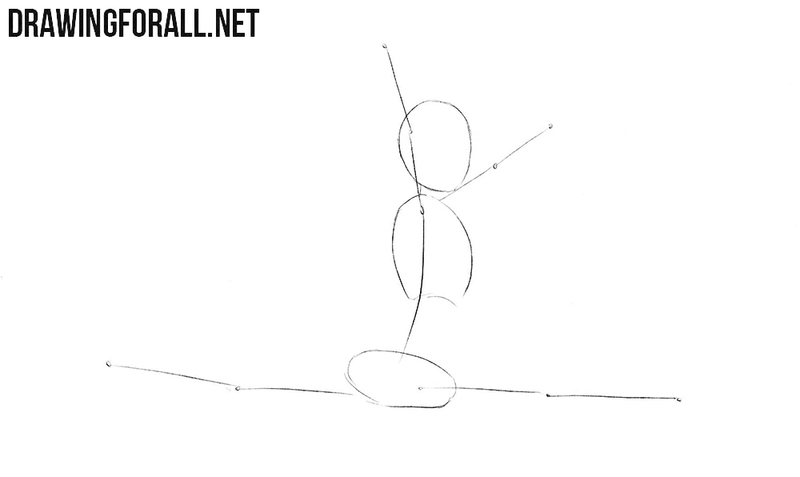 This step of the lesson on how to draw a gymnast will be both difficult and simple. Here we will need to draw out the face of the gymnast in detail. To do this, we accurately circle the outlines of the face with very clear and dark lines. Next, draw the details of the face and outlines of the hair. Now one more rather simple step. Using clear and dark lines, we carefully draw out the contoursof the torso of the gymnast, taking into account all the curves of the body. Remove all unnecessary guidelines from the torso, draw the outlines of clothes and add the necessary folds of fabric. Now we will rise a little higher and start drawing the arms of the gymnast. Continuing the lines of the torso, we carefully draw the outlines of the arms, as shown in our example. Next, carefully draw the hands and fingers, remove unnecessary guidelines from the arms and draw the details of clothing. Now we will do exactly the same actions as in the previous step, but with the lower part of the gymnast’s body. That is, continuing the lines of the torso, we are carefully drawing the outlines of the legs, taking into account all the curves and muscles, as shown in the example below this text. The drawing of the gymnast is almost complete, and now we need to deal with the final touches. Remove any remaining unnecessary guidelines from the gymnast drawing. First, paint the hair, as shown in the example below. Next, using the classic hatching draw shadows. 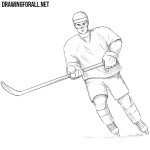 In the future the team of drawingforall.net is going to create even more drawing lessons about the most diverse representatives of different sports and professions. 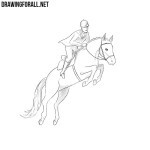 Therefore, visit our site as often as possible so as not to miss a single new drawing tutorial.